LFCHD employees who are expressing breastmilk during their shift can now count one session per day for a wellness point, up to 20 points per month and up to 6 months of time. The update began Aug. 1. This opportunity coincides with National Breastfeeding Month 2015, which recognizes the extra work that many new mothers take on to continue breastfeeding and expressing milk after they return to their jobs. It also aligns with the national Fair Labor Standards Act, which requires employers of hourly workers to accommodate their needs for expressing milk. Finally, it supports our own employees who often use their break and lunch time to express milk, instead of participating in walking programs or other Wellness projects. Employees who qualify should note their time using the standard Personal Exercise Plan Calendar for the Wellness Program. This new program is not retroactive; points may only be collected from Aug. 1 forward. If you have any questions, please contact Doraine Bailey at ext. 2348 or Ruben Perez at ext. 2410. Our HANDS program has undergone some exciting changes! In the past, the program was only for first-time parents, but it has now expanded to include families who have more than one child. The expansion was made possible by Gov. Steve Beshear, who included funding for HANDS in the state general fund. HANDS is a free, voluntary program that pairs up parents with skilled mentors who make in-home visits to provide support in building healthy and safe environments for children. 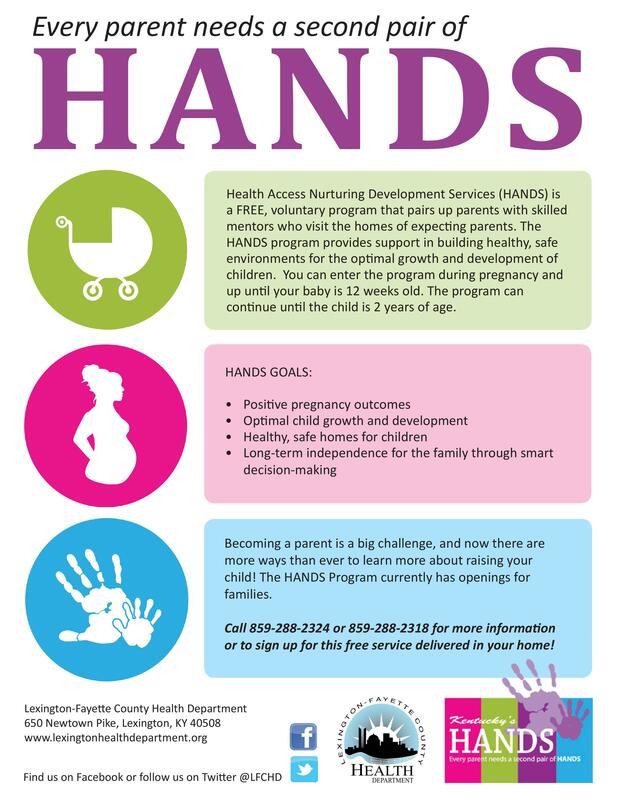 HANDS is now available for any pregnant woman or for parents whose baby is up to 12 weeks old. The program can continue up until the child is 2 years old. The following flyer has been created for HANDS to use to explain services. If you’d like a copy, please see Moni Shields or Bailey Preston.